ManTech is a company born out of the need for increasing national defense as the United States became a world superpower, and we’re among a generation of leaders and companies that laid the foundation for today’s government services industry. Our two founding partners, George J. Pedersen and Frank Wertheimer, shared that vision and formed ManTech in 1968, based on their experience in national defense. Today, George is the first and only CEO and founder to lead a company of that generation to its 50th anniversary. That is quite an achievement. It all began back in the 1950s and 1960s at Vitro Corporation, where George and Frank worked together. Vitro was a pioneer in its own right, remembered for its contribution to the Manhattan Project in World War II. The nuclear focus brought Vitro, and thus ManTech, into the submarine community, and ultimately the Navy would prove to be ManTech’s first customer. From the start, our company was highly aggressive, entrepreneurial, flexible – and fast moving. In just our 3rd year of business ManTech made our very first acquisition. Then, as now, our acquisition strategy was driven by a single principle: To acquire companies based on gaining capabilities, and expanding into new customers and locations. There’s a story George likes to tell that illustrates the point. He was meeting with a NAVAIR customer and they said, “George, you are with the fleet side of the Navy – you don’t know the NAVAIR side.” So ManTech went out and bought a NAVAIR company that would help map our strengths to the customer’s needs. In all, ManTech has made a total of 60 acquisitions – more than one per year – in the last half century, including from large systems providers at a time when they decided that services were not where they wanted to be. In addition to acquisitions, ManTech has measured our success with key metrics such as the number of contracts, the amount of cash on hand, and after we went public, our stock price. One of the most important measures of success for any company is the number of employees we have supporting our customers’ missions. At five years, we had 70 employees, at 10 years we grew to 350 people, at 15 years we had 1,100 employees, and today we have nearly 8,000. Not many companies can make that claim. I credit two main drivers for our success. Second, ManTech has been highly adaptable, and quick to seize opportunities that few others saw. “Outside the box” thinking is our trademark. A prime example: the decision made in the 2000-2001 timeframe to redirect our focus on the federal government with expansion into the intelligence community – and to go public. The decision to IPO occurred as the tech bubble went bust and the NASDAQ had plummeted over 50 percent. ManTech filed to go public in late 2001. We divested $100 million of business, and we deployed all-new ERP and HR systems. We went public and did a secondary in 2002, a year when fewer than 50 companies IPO’d compared to 350 the year before. Other companies that went public the same year as ManTech included PayPal and Netflix. ManTech, of course, had a very different focus: mission-critical work in safeguarding national and homeland security. That commitment, always a key characteristic of ManTech, took on dramatic significance during the run-up to our going public. I’m referring, of course, to the horrific events of September 11, 2001, a day that left an indelible impression on everyone. We were firmly resolved to support our nation in the war against terrorism. In that first year of being a public company we acquired three businesses – all focused on the intelligence and special access communities where the need was great. From 2002 on, our business grew exponentially as we supported accelerating demand in missions to combat and preempt terrorist threats. Today we are a $1.9 billion company that boasts the industry’s highest book-to-bill ratio and strong, industry-leading organic growth. Tremendous credit for this achievement goes to George Pedersen, whose vision and commitment have been the guiding light for ManTech, and some would say, for the industry itself. There are very few individuals who have led a business to the 50-year mark and possessed his entrepreneurial spirit and energy. George has always followed his gut and written his own script, regardless of what doubters and others might say. He has always “put the nation first,” and worked hard to make ManTech one of the most respected companies in our industry. That kind of passion and commitment to the mission and to our people remain very relevant today, and make ManTech a company with staying power. 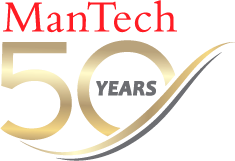 George himself is always the first to credit ManTech people, and all the many friends who have supported us this past 50 years, for our company’s remarkable longevity and success. For our current and former employees, as well as our partners -- We should all be proud of this journey we’ve made together and what ManTech stands for today.